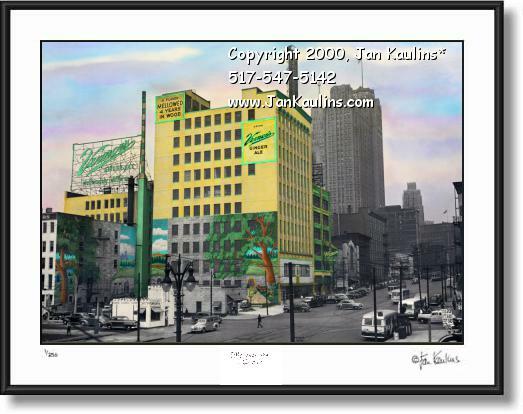 VERNORS PLANT photo picture VERNOR'S DETROIT photo picture print for sale. OLD DETROIT VERNORS PLANT photographs prints art photography for sale. Detroit Vernor's Ginger Ale Building Plant photo print art picture for sale: This Old Detroit Vernor's Plant Building picture photo is a very rare image of The old Detroit Vernor's Ginger Ale factory plant building at the foot of Woodward Avenue in downtown Detroit, circa 1940's. This wonderful historic color photo of The Old Detroit Vernors Ginger Ale Factory Building is made from an OIRIGNAL BLACK AND WHITE PHOTOGRAPH THAT HAS BEEN HAND-COLORED and printed by artist/photographer Jan Kaulins. Vernor's Ginger Ale was first served about 150 years ago by Detroit Pharmacist James Vernor in the soda fountain in his Drug Store at 235 Woodward Avenue. Many Detroiters may recall the huge illuminated Vernor's Ginger Ale sign, seen prominently in this Vernor's picture photo. In this Detroit Vernor's Ginger Ale factory building photo picture on the side of The Vernor's Building we see the large Verner's Ginger Ale signs toward the top of the building and the wonderful large magical woodland murals, including the Vernor's Gnomes sitting in front of a castle door guarding the many brown kegs of Vernor's Ginger Ale piled up behind them, painted on the wall five stories tall of this huge building. Also, in this historic Vernor's Ginger Ale Plant photo you can see the small White Tower 5 Cent Hamburger Stand that was also a downtown Detroit landmark for many years. On the street are vintage vehicles and Detroit Streetcars and Trolleys. These are all gone now, but this photo captures that wonderful era in early Detroit's history. Up Woodward Avenue you can see the tall Guardian Building in the background. This is a wonderful photo of old Detroit in it's prime. TO SEE ALL OF THE OTHER DETROIT PHOTOS IN THE DETROIT PHOTO GALLERY, JUST CLICK ON THE ' HOME--Return to All Galleries' LINK BENEATH THIS PARAGRAPH ON THIS WEBPAGE.